Morgan Diving Center works in Sardinia South East coast, one of the most fascinating sites in the whole area of the Mediterranean Sea, since 1997. Quality, safety and professionality are its highlights. 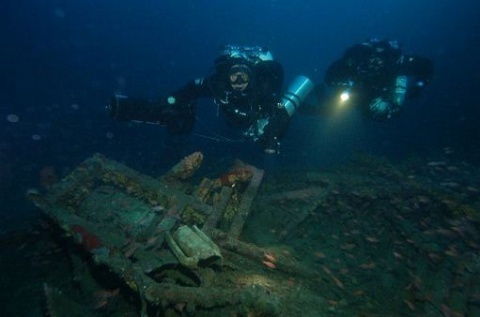 The fascinating wrecks that lie on the sea bottom are one of the main attractions of this area. Dating back to World War 2, they were sunk by mines or attacked by british submarines that operated behind enemy lines, and have maintained excellent conditions. The wrecks are easly visible in clear water within 30-40 meters by horizontal sight distance. They host a very rich flora anda fauna and occasionally it is possible to see dolphins and tunas. Throughout the year Morgan Diving Center organizes Scuba courses for every level, NAUI, PADI, TSA , FIAS , from Open Water Diver up to the technical and Trimix Wreck Diving. In the last years Morgan Diving has become a local refence for Global Underwater Explorers (www.gue.com) courses, from Gue Fundamentals up to Tech 2. For a full service and to benefit of our numerous conventions you can contact the Diving Center. We can help you to arrange your trip to Sardinia, by ferry from Mainland Italy or with the many low cost flight opportunities, and to choose the best accomodation between Bed & Breakfast, camping sites and hotels in the area. We’ll be also pleased to recommend you the best restaurants where you’ll be able to enjoy the local kitchen.